Our fabrics are made of only the highest quality plastic yarns from reliable suppliers, ensuring excellent quality and stability of our products. PET (Polyester) with high resistance to hydrolysis is used for production of dryer fabrics. PEEK (Polyetheretherketone) is 100% hydrolysis and pH resistant. It is used for production of dryer fabric spiral seam to increase resistance to hydrolysis and cleaning chemicals. PET (Polyester) with higher resistance to stickies decreases adhesion of stickies to the fabric. This material is used for production of anti-stickies dryer fabrics suitable for drying of brown grades. PPS (PolyphenyleneSulfide) is 100% resistant to hydrolysis. It is usually used in the dryer section with a high temperature where PET dryer fabrics are usually hydrolysed. PPS is used to produce either the whole dryer fabric or edges only, since they are most commonly abraded as a result of the high temperature in the dryer section. Abrasion resistant PET (Polyester) is used for production of filter fabrics. PAD (Polyamide) is used for production of abrasion resistant filter fabrics and fabrics used for filtration of alkaline sludge with high pH. PP (Polypropylene) is used for production of fabrics with high chemical resistance. 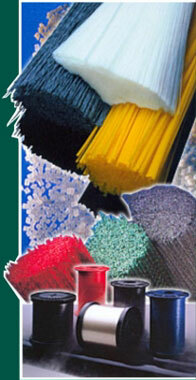 Polypropylene is pH resistant in a wide range of values.